„Æskilegt er að landsmenn borði meira af grófum heilkornabrauðum og öðrum heilkornavörum til að stuðla að bættri heilsu,“ segir í frétt Landlæknis. Íslendingar borði aðeins hálf brauðsneið á dag að meðaltali. “It is desirable that people eat more whole-grain bread and other whole-grain products to support improved health,” says news from the Directorate of Health. 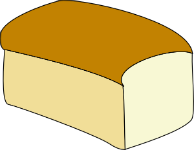 Icelanders eat only half a slice of bread per day on average. I guess the most interesting thing I found in the article was the phrase draga úr líkunum, which I finally figured out was similar to reduce the risk/likelihood/probability.